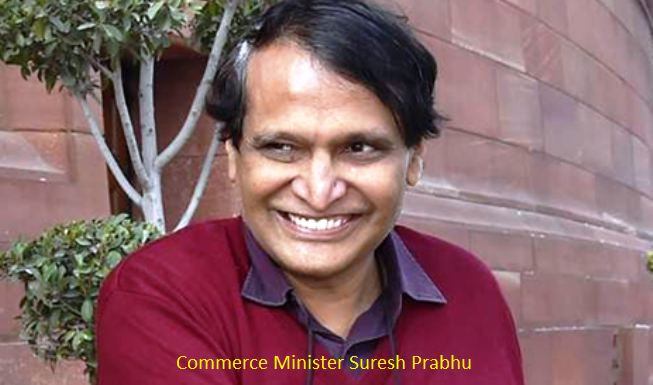 Commerce Minister Suresh Prabhu called upon states to explore ways of trapping into the global trade which is estimated at five trillion US dollars this year by promoting service exports, organic farming, value addition to agricultural productions and utilization of benefits accorded to the Special Economic Zones. The Minister who was chairing the third meeting of the Council of Trade development and Promotion in the national capital on January 8th stressed the importance of creating an enabling environment for promoting exports. He said there was a need to develop state and district level strategies. Districts should be the new units of growth and planning should be done around this, he added. The Minister further said that a new agricultural exports policy is required that lays focus on increasing exports of value-added agricultural products so that farmers can access international markets and increase their income. Mr Prabhu released a study �LEADS-Logistics Ease Across Different States� which is a first ever sub-national logistics performance index. He also released the �State Exports Booklet� which is a compendium, of the status of exports from the States over the last 10 years. He also urged urged the Members of the Council, who are state ministers that there was a need to jointly address impediments in trade and the logistic and infrastructure gaps which affect India�s exports. The Chief Minister of Goa, Deputy Chief Minister of Gujarat, Ministers from 11 states, senior state government officials and industry bodies attended the meeting. Deputy Chief Minister of Gujarat Nitin Bhai Patel said that frequent changes in the export regulations cause hardship to exporters as this renders existing contracts in-fructuous. He echoed the sentiment of providing agri product exporters subsidy on the lines of MSP support provided to farmers. Mr.Amar Nath Reddy, Minister (I&C), Andhra Pradesh sought the support from the centre for resolving issues relating to the pharmaceutical sector which are major exports from the state and a facilitation centre to increase the exports from the state. Mr. Prem Kumar, Minister (Agriculture), Bihar requested that the centre should support creation of Export Infrastructure like ICD, support the promotion of agricultural exports and the value addition. Mr..Chander Mohan Patowary, Minister from Assam mentioned the possibilities of the north eastern states being positioned as the gateway to the ASEAN market, specially for IT/ITeS due to its proximity to these countries. Mr Chander Prakash, Minister (Industries), Jammu and Kashmir requested the setting up of industries related to Railways and Defence in the state. Shri Prafulla Samal, Minister (MSME, W&CD and SSE&PD), Odisha stressed that all the states are to be provided an equal support in the promotion of exports. He requested the creation of export infrastructure like cargo complex and stationing of the concerned authorities. Mr Amar Aggarwal, Minister (I&C), Chattisgarh mentioned that efforts are being made in the state to promote export of forest products which should be supported by the centre. Mri C.P. Singh, Minister (Urban Dev. & Housing Deptt. ), Jharkhand requested the increased presence of the Councils in the State to guide exporters and mentioned the initiatives being taken up by the state in promoting exports by setting up a free trade zones and a power SEZ. Mr. R.V. Deshpande, Minister (Large & Medium Scale Industry), Karnataka mentioned that there was delay in refunds under the GST and that there is a need to unify the refund of commercial tax and duty drawback. He emphasized that states should look at promoting skills related to export industries. Mr Rajendra Shukla, Minister (Industries), Madhya Pradesh mentioned the additional incentives being provided by the state government to exporters. He mentioned that the state has identified logistics development as one of the growth sectors. Mr Madan Kaushik, Minister (Urban Development), Uttarakhand mentioned the need for strengthening of air cargo and trade infrastructure in the hill states and the NER. He sought the support of the centre for capacity building in the identification potential export commodities.